I am a big fan of Spike’s Ink Master. It is an elimination-style reality show, where tattoo artists compete for $100,000 and a feature in Inked Magazine. On one of the final episodes last season, artists did post-mastectomy tattoos for breast cancer survivors. There were some beautiful pieces in there! Episode highlights here. This season there is also a breast cancer-related episode and it airs tonight (November 18 @ 10pm EST on Spike). DeAngelo Williams of the Carolina Panthers appears as a guest judge. He talks about his mom and her four sisters who all died from breast cancer. The artists are designing a piece to honor DeAngelo’s family. What he doesn’t say in the previews, and I’m not sure if he mentions in the full show, is that his mother and her sisters all carried a mutated BRCA1 gene, which they inherited from their father, DeAngelo’s grandfather. He and his two sisters are negative for the mutation. What does this have to do with the pinking of the NFL? I don’t watch football and don’t follow the athletes at all, but I have noticed that there’s an awful lot of pink out there. I did not know DeAngelo’s story or that he is largely responsible for the players of the NFL wearing pink during Breast Cancer Awareness Month. 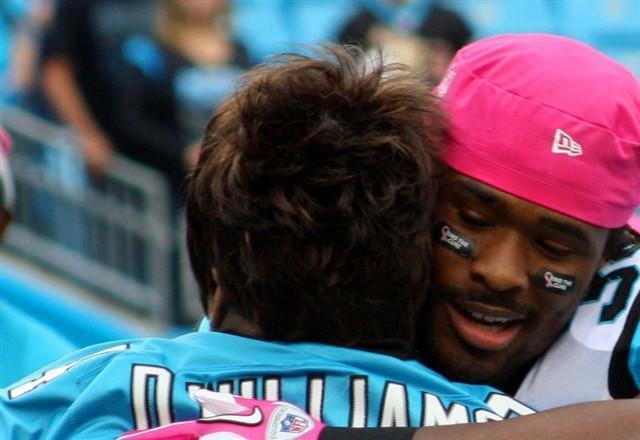 His mom was the inspiration behind the idea for players to start wearing pink cleats five years ago. In the BC and HBOC worlds there has been a lot of talk around awareness (aren’t we all aware? ), the love or hate for the month of October (aka Pinktober), and pinkwashing, but that’s another topic for another day. I am just sharing the previously-unknown-to-me sotry of the pink in the NFL. Are you going to watch tonight? I am! 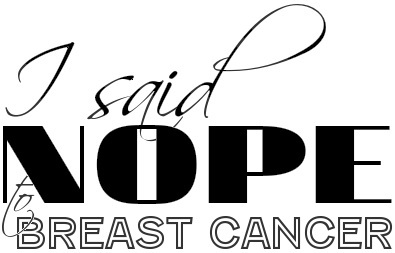 This entry was posted in All and tagged Awareness, BRCA, breast cancer, DeAngelo Williams, HBOC, health, Pinktober, pinkwashing on November 18, 2014 by nope2BC.